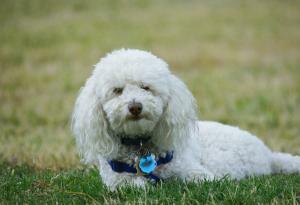 The Bichon Frise is a dog of Mediterranean descent that has always had a loyal following. Once the favoured breed of European royalty and aristocracy, today the Bichon remains a popular choice with modern families wanting a small, long-haired companion dog. But how did the Bichon Frise come about? And how has it changed through history? Let’s go back to the turn of the thirteenth century when these dogs first started appearing on the Canary Islands. Descending from the Barbet, or French Water Spaniel, it’s believed these dogs were traded with Spanish sailors en-route to the islands, who introduced them to Tenerife – where most ended up and remained. Here they acquired their original name – the Bichon Tenerife. By the early 1300s, Italy became a centre of trade and sailors soon discovered the Bichon and returned with it to the Continent. Once in Italy, the dog was immediately snapped up by the nobility and merchant middle classes who saw in it great potential. From here, the Bichon was transported to the French courts with the advent of the Renaissance and quickly became a favourite with Francis I. Later, during the reign of Henry III, the Bichon’s popularity skyrocketed as the king took to carrying his beloved dog in a tray around his neck. So taken was he with his small white dogs that he pampered and preened them and devoted members of staff to ensuring their personal care. Napoleon was another Bichon enthusiast who kept many of these dogs in his royal household. Many famous artists also expressed their love for the Bichon through their paintings and artwork, which helped identify where the breed was present at the time. Despite the Bichon enthusiasm that had been sustained for centuries, it fell to obscurity during the French Revolution when dogs associated with the royal and aristocratic were slaughtered by revolutionaries. They subsequently became linked to lower street and circus performers and musicians, although this rejection wasn’t to last. Following the First World War, the popularity of the Bichon as a companion dog returned and fanciers began breeding these dogs in earnest. However, it wasn’t until 1955 that it made its way to America alongside a Mr and Mrs Francois Picault. In 1964, the Bichon Frise Club of America was formed and groups of breeders began consolidating their efforts to re-establish the breed. Nowadays the Bichon remains popular in the domestic setting and in all walks of life. Young and old can enjoy the breed for its friendly and sociable nature, practical size and non-shedding coat. Other breeds of the Barbichon group include the Bichon Maltese, Bichon Havanese and Bichon Bolognese.